Today, Amazon announced one of the coolest uses of voice technology in recent years: Echo, a voice-activated home assistant. It’s basically like if the Jawbone Jambox had Siri built in. The tech itself looks neat, but Amazon’s marketing team made a huge mistake when they announced it: the script was awful. Pretty groan-worthy, right? There are some things they did right. Here’s a breakdown of what your marketing team can learn from this billion-dollar company’s profoundly dumb video script. First, there are plenty of things this video does right. It’s clear the video script writer (probably NOT a copywriter, based on the quality of the lines) knows that you should try to address concerns in videos. For example, when the dad tells the mom, “You don’t have to yell at it.” I love using voice-activated technology (my secret dream tech is the smartphone-earbud combo in Spike Jonze’s Her – I actually prefer the “dumber”, non-ScarJo version to the sultry upgrade!). It’s my dream to have a house I can talk to for simple information. Amazon does a great job at showing the device in everyday use cases. Just the other day, I was wondering how many teaspoons were in a tablespoon. But since my fingers were covered in cooking oil (don’t ask), I had to eyeball it instead of asking Siri or Google Now via my smartphone. If I’d had Echo in my kitchen, I would have had no problem asking it for a simple conversion. Hands free = win. As someone owns a Fire TV, I can say the voice recognition is pretty awesome. I don’t have to speak into my remote like a robot (which I have to do sometimes with Siri). Despite the awkward insertion of these pain points, I was left with some pretty big unanswered questions. Like, “It only hears you when you use the wake word we chose.” So doesn’t that mean it’s always listening for the wake word? I get that they’re trying to say it’s not an NSA listening device without actually saying that. But the wording was confusing and immediately made my inner critic find a flaw with their argument. Another unanswered question: how does Echo handle multiple devices in the same home? Do they all speak to each other so that you don’t have three robotic voices shouting the same answer from multiple speakers? 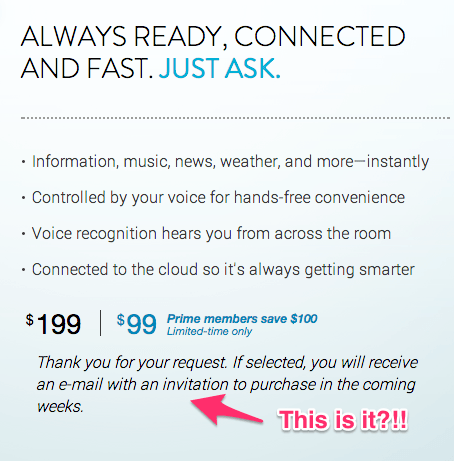 This product is clearly for early adopters (they’re even using “invitation only” exclusivity to build some buzz). Why not address the kinds of questions tech-savvy early adopters are likely to have, like the multiple device question? Also, the husband came across like kind of an a-hole. A little too condescending for a guy who looks like Paul Giamatti’s little brother. I mean, who pretends they don’t have to go to work on a Thursday? It crosses the line into unbelievability. Finally, when you actually visit the site and request an invitation, there’s no big “You did it!” confirmation message – just a small, text-only indicator you’d maybe get an email. You should give users more of a “cookie” for taking an action. It’s Gamification 101. This isn’t the worst ad ever. It does a decent job, but it’s definitely got room for improvement. More naturally integrating real world use cases into the video would have worked much better. And can we get some diversity in here, Amazon? Of course, all of these problems could have been solved with a better copywriter. Writing video scripts is tricky, especially when you’re tasked with introducing a new technology. However, that’s no excuse for an awkward script. Dialogue needs to sound natural when making an announcement this big. If you’re working on a video project of your own, contact me for a free initial consultation, and I’ll give you some advice on how to include pain points in a way that won’t make your customers turn off. Maybe I’m completely off-base with my complaints. Let me know what you think in the comments! After running this ad by some fellow copywriters at the Warrior Forum, I’m reconsidering the word “terrible” (though Reddit seems to agree with my initial response). Not just one group, dear video watcher, but for you specifically. Explanation of product and ground layer info before further demonstration. More info, basics are explained. Not, “you’ll love echo” or “you’ll think it’s neat.” No, Echo *IS* neat. There is no debate. (And in the voice of a cute little girl who 5 seconds ago had no idea what it was). You lazy people out there. No work. Just so simple. You do nothing…but ask. HINT HINT, Buy it for your dad for Christmas!!! Useful for a busy mom who always (literally) has her hands full and can use help with wife-responsibilities. Useful for teens to…continue living in the sheltered world of teenhood. Not “it’s going to be.” It *IS* part of the family. The cute family in happiness-land that enjoys Echo so much and gets so much out of Echo. The purpose of the video is not to be a great video. The purpose is to introduce a product and get it sold. It grabs attention. It creates interest. It creates desire. It has a call to action. Anything else and it may even distract from the intended goal. I think caring about the video too much is like and English professor being upset that a salespage has short sentences and short paragraphs. So the dialogue was cheesy…no oscar award. I don’t think Amazon will care that it won’t be getting any awards when it’s rolling in the dough. Is Samsung’s Ad Targeting Perfect or Stupid?